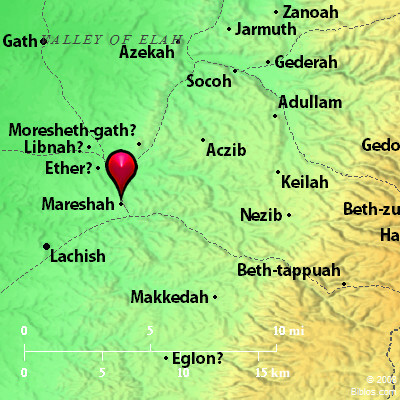 ma-re'-sha (mareshah; Septuagint: Codex Vaticanus Bathesar; Codex Alexandrinus Maresa): A town in the Shephelah of Judah named with Keilah and Achzib (Joshua 15:44). It occupied such a position that Rehoboam thought well to fortify it for the protection of Jerusalem (2 Chronicles 11:8). In the valley of Zephathah at Mareshah, Asa overwhelmed Zerah the Ethiopian and his army, pursuing them as far as Gezer (2 Chronicles 14:9). From Mareshah came Eliezer the prophet who denounced disaster upon the commercial copartnery of Jehoshaphat and Ahaziah (2 Chronicles 20:37). The place is mentioned in Micah (2 Chronicles 1:15). Mareshah was plundered and burned by Judas Maccabeus (Ant., XII, viii, 6; 1 Maccabees 5:66 the Revised Version margin). Hither Gorgias escaped, having been rescued from the hands of Dositheus by a Thracian horseman (2 Maccabees 12:35). It was taken by John Hyrcanus, who allowed the inhabitants to remain on condition that they adopt circumcision and submit to the Jewish law. This they did; and later John avenged an injustice done to Mareshah by the Samaritans. It is then described as "a colony of Jews" (Ant., XIII, ix, 1; x, 2). The city was treated with favor by Pompey (XIV, iv, 4). When the Parthians invaded Judea in support of Antigonus they demolished Mareshah (xiii, 9). According to Eusebius, Onomasticon, Mareshah was 2 Roman miles from Eleutheropolis (Beit Jibrin). Until recently it was thought that Khirbet Mir`ash, where the old name lingers, not far Southwest of Beit Jibrin, represented the ancient city. The work of Dr. Bliss, however ("Excavations in Palestine," PEF), shows that it must be located at Tell Sandachannah, about a mile South of Beit Jibrin. A series of remarkable tombs was discovered here. From 1 Chronicles 2:42 we may perhaps gather that Hebron was colonized by the men of Mareshah.